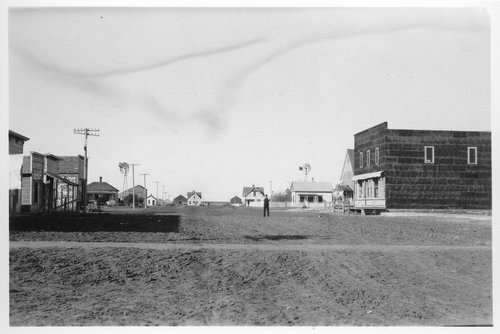 These are five photographs of downtown Selden, Kansas, in the 1890s. Businesses shown are Selden State Bank, Frenzen Dry Goods, Wilkins Groceries, Miller Mercantile Co., Saathoff. Bros. General Merchandise, Chicago Lumber and Coal Company, and a barber shop. For a 1940's view of the business district, see Item Number 219532.